When Belgium and the rest of the Low Countries fell to the Nazis at the outset of WWII, people around the world saw it in grainy newsreels, filtered impersonally through the impassive eye of a camera lens. As it trickled to us, through history, it got even more abstract, made distant and unreal by dint of black-and-white. This wasn’t the case, of course, when Belgium was attacked by ISIS last week. We had instant updates, graphic color footage, and the tweets and personal videos recorded by thousands of smartphones. Those who weren’t there were safe and unharmed, of course, but didn’t have the comfort of distance. 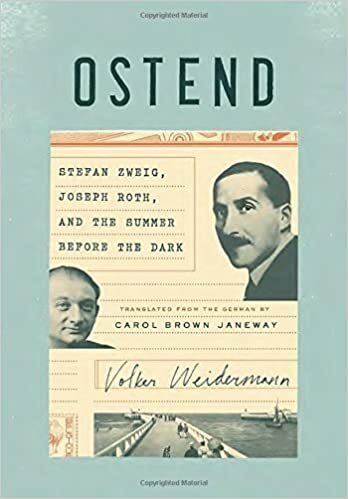 Those attacks, and their personal immediacy in our lives, give a certain poignancy to Volker Weirdermann’s non-fiction novel (in the nice formulation of Independent reviewer Lucy Sholes) Ostend: Stefan Zweig, Joseph Roth, And The Summer Before The Dark, translated excellently this year by Carol Brown Janeway. In it, a handful of great European writers, including two of the continent’s best, grapple with friendship, love, literature, alcohol, and the looming madness overtaking their homes, ready to burst forth everywhere, as they spend an uneasy summer in the once-idyllic beachfront town on the Belgian coast. Like with today’s social-media carried attacks, we see the end of one reality in an extreme closeup, with unflinching unease. Weidermann’s small book is written as a novel, drawn from biographies, letters, memoirs, and more. It isn’t meant to be an important biography, and certainly not definitive, but an elegant capturing of time and place, of the mental state of a small group of people and of the world in whole. In this, he straddles an uneasy line between assuming we already know Roth and Zweig, and filling in the details. I think this is unsuccessful, at least personally. Roth I know well, and so could fill in the gaps; Zweig less so, and the others barely at all. There are sometimes in-depth biographical details of minor characters, like the Communist leader Willi Muenzenberg, who we barely see after a (relatively) lengthy and fascinating introduction, and barely anything at all on the writer Hermann Kesten, who appears in many scenes and seems to play a central role. One got very little sense of his literature, and for someone like me, who was wholly unfamiliar with him, he could have been a waiter or a hanger-on. Still though: that is more a testament to my ignorance of mid-century Germans and Austrians, and the book doesn’t attempt to give a full picture. Instead, it focuses mainly on the difficult and fruitful friendship between Roth and Zweig. Zweig, world famous and rich, doted on and worried about his gloomy, pessimistic, and deeply unhealthy friend, who was drinking himself to death in a prolonged fit of loathing and despair. Roth, as much as or more than anyone, could see the rot in Europe, could feel the howling insanity that was being unleashed. He had been feeling Europe’s doom since the collapse of his beloved Hapsburg Empire, and was unflinching about the rise of fascism. He never allowed himself a comfortable lie that things would get better. In a brilliant essay from 1933, “The Auto-De-Fay Of The Mind”, (as translated by the great Michael Hoffman in What I Saw) he expounds brilliantly and presciently about what this all means. “Mechanized orangutangs”- has any writer ever captured the technical madness of our world better? It takes the slightest tweak to update that for the age of mass communication, and the way our greatest achievements and darkest hearts aren’t two sides of the coin, but a non-Euclidian moral blend, somehow always facing the same way, inseparable. Roth understood this better than any writer of his time, and maybe any other. By 1936, the rest of the world was catching up, certainly his writer friends, who by the end of the year had stopped hoping for a miracle. Zweig, who the book cleverly takes back to Ostend in 1914 a handful of times, when he was equally dismissive and excited about the war, has come around to the idea that moral progress is an illusion. There is a theme running through of letting go. He left his wife for his mistress, left his castle to the Nazis, and finally even left his dear close friend Joseph Roth behind: Roth, who even while he was drinking himself to death, managed to contribute several pages of brilliance to Zweig’s novel The Buried Candelabrum, the part that made the book whole. That might be the issue with Weidermann’s story: you don’t get a true sense of the genius the two share. Zweig seems too naive in a way, and Roth too miserable. He was, of course, but someone new to this wouldn’t be too tempted to read him. The brilliant and clear-eyed journalism of Roth is barely mentioned. We see the writing process, but there is no wonder. Perhaps that is a strength. Perhaps we are meant to see them as flawed and difficult people, to give the writer’s clay feet. If so, though, there was no need: anyone familiar with Roth knows he does so himself, in all his writing. But the sense of personal tragedy never really mixes with the continental and global one. The dread seems too internalized, and you don’t have the feeling of an closing age, unless you fill it in yourself. That isn’t to say the book is not worth reading. It has some wonderful scenes, is a neat introduction to a time and place that seems so distant, even as it is recognizable today. He does paint great portraits of interesting women, some who are doomed, others who survive, including Roth’s last lover, Irmgard Kuen, a bon vivant, a brilliant drinker, and a gifted writer who hid from the Nazis after a false report of her death, and who saw a late rescue from obscurity toward the end of her life. In the end, Zweig and his mistress/secretary-turned-wife commit a romantic and meaningful joint suicide in Brazil (he left a beautiful not; she, in a summation of their relationship, left nothing to be remembered by), and Roth, on the brink of madness, drank himself to death. If the book just focused on those two events, it would tell you just as much about these writers, and the uncertain world they left behind, which gave birth to our tumultuous present. This entry was posted in Books!. Bookmark the permalink.